SANTA MONICA, CA and VANCOUVER, BC, March 12, 2017 – Lionsgate (NYSE: LGF.A, LGF.B) announced today that the dazzling Academy Award® and Golden Globe®-winning music-filled masterpiece La La Land arrives on Digital HD on April 11 and on 4K Ultra HD Combo Pack (plus Blu-ray and Digital HD), Blu-ray Combo Pack (plus DVD and Digital HD), DVD and On Demand April 25 from Summit Entertainment, a Lionsgate Company. Written and directed by Academy Award® winning director Damien Chazelle and starring Oscar® Best Actor nominee Ryan Gosling and Oscar® Best Actress winner Emma Stone, La La Land tells the story of Mia, an aspiring actress, and Sebastian, a dedicated jazz musician, who are struggling to make ends meet in a city known for crushing hopes and breaking hearts. Set in modern-day Los Angeles, this original musical about everyday life explores the joy and pain of pursuing your dreams. La La Land is more than the most acclaimed movie of the year — it’s a cinematic treasure for the ages that you’ll fall in love with again and again. Emma Stone and Ryan Gosling star as Mia and Sebastian, an actress and a jazz musician pursuing their Hollywood dreams — and finding each other — in a vibrant celebration of hope, dreams, and love. Damien Chazelle’s magical interpretation of the City of Angels is destined to be a modern classic and an icon of the era. The home entertainment release includes the breathtaking film to watch again and again, as well in-depth bonus material revealing the untold story of how Damien’s passion project came to life. The 4K Ultra HD, Blu-ray and Digital HD special features include audio commentary by writer/director Damien Chazelle and composer Justin Hurwitz, and 10 behind-the-scenes featurettes including: “Another Day of Sun: They Closed Down a Freeway” which gives a behind-the-scenes look at how Damien Chazelle and his team had only two shoot days to make the film’s spectacular opening number a reality; “La La Land’s Great Party,” looking at the creation of the Hollywood Hills party scene; “Ryan Gosling: Piano Student” showing how hard Ryan Gosling worked to truly play the piano as Sebastian; “Before Whiplash: Damien Chazelle’s Passion Project,” that uncovers the story of La La Land’s origins; “La La Land‘s Love Letter To Los Angeles,” in which the term La La Land is explained; “The Music of La La Land” delving into the process of creating the iconic music; “John Legend’s Acting Debut” featuring the Grammy®-Winning singer’s thoughts on being in the film; “The Look of Love: Designing La La Land,” with interviews with the film’s design team; “Ryan and Emma: Third Time’s the Charm,” marking the third time in which Ryan Gosling and Emma Stone have starred on screen together, and “Epilogue: The Romance of the Dream,” exploring the extraordinary ending to the film. The 4K Ultra HD, Blu-ray and Digital HD also feature “Damien & Justin Sing: The Demos”, showing the original pitches for the film. The 4K Ultra HD and Blu-ray of La La Land will feature a Dolby Atmos soundtrack remixed specifically for the home theater environment to place and move audio anywhere in the room, including overhead. 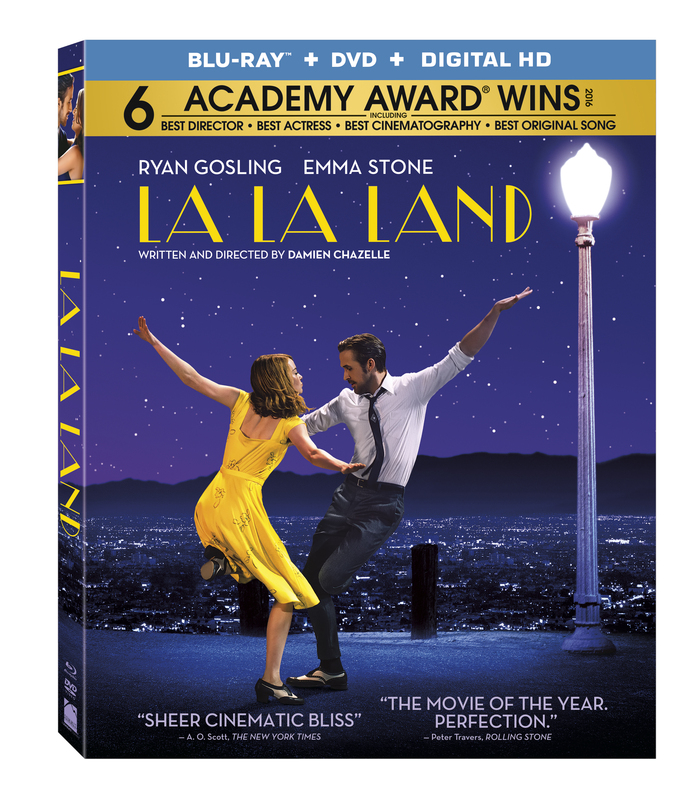 The La La Land DVD features audio commentary with Chazelle and Hurwitz, “La La Land’s Love Letter to Los Angeles,” and “Ryan and Emma: Third Time’s the Charm.” All releases include song selection. La La Land will be available on 4K Ultra HD Combo Pack, Blu-ray Combo Pack, and DVD for the suggested retail price of $42.99, $39.99 and $29.95, respectively. Title Copyright: © 2016 Summit Entertainment, LLC. All Rights Reserved. The Company’s feature film business spans eight labels and includes the blockbuster The Hunger Games franchise, the Now You See Me series, the box office blockbuster La La Land, which won six Academy Awards®, the hit franchise sequel John Wick: Chapter Two, double Oscar winner Hacksaw Ridge, Tyler Perry’s Boo! A Madea Halloween, The Shack, CBS Films/Lionsgate’s Hell or High Water, Roadside Attractions’ critically-acclaimed Manchester by the Sea, Codeblack Films’ breakout concert film Kevin Hart: Let Me Explain and Pantelion Films’ Instructions Not Included, the highest-grossing Spanish-language film ever released in the U.S.